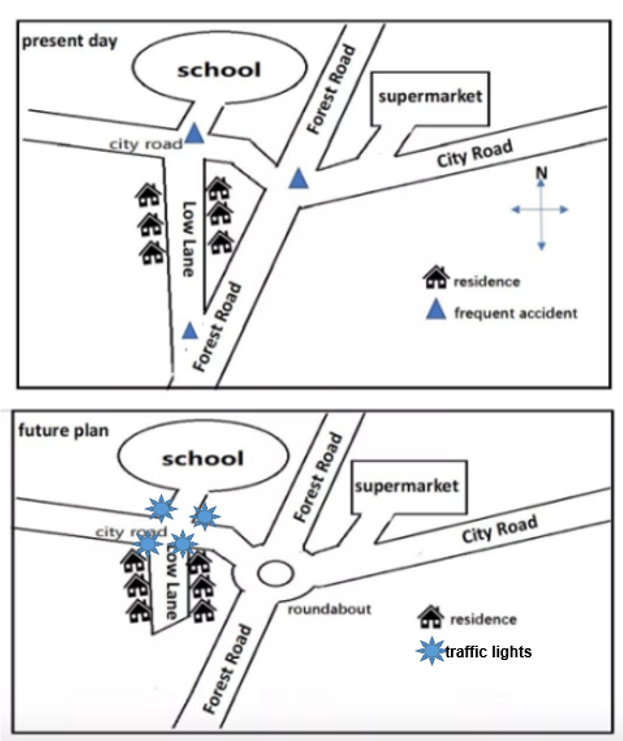 题目：The maps show the proposed change of a particular fields in order to reduce the traffic accidents in the UK. The two maps illustrate some proposals to improve the road construction of a particular area in UK for the sake of traffic safety. At present, the road network is made up of two roads and a small lane, with each two intersecting. The City Road that runs from east to west connecting the school and the supermarket intersects with the main north-south Forrest Road at the center area which is the spot with a high incidence of accident. The west side of City Road and the south of Forrest Road are joined by Low Lane which goes through the residential zones. The both ends of the lane are also the sites where traffic collisions usually happen. It is predicted that, in the future, the principal change to the road system will be design of a roundabout on the crossing of Forest Road and City Road as well as traffic lights to help alleviate traffic collisions and guarantee normal flow of vehicles. In addition, Low Lane will be rebuilt without linking to Forrest Road any more. This will restrain the residents from going directly to the main road, which is dangerous. 题目：Although more and more people read news on the Internet, newspapers will remain the most important source of news. Do you agree or disagree? As the world goes into the digital age, many old ways of living have been overshadowed by the threat to be substituted with the burgeoning internet—and newspaper is no exception. Despite the fact that the time-honored traditional press is losing its power, some people still believe it will retain the dominance in news delivery. However, I am quite doubtful about this view. In the era of information revolution, individuals are eager to catch up with the time and update their knowledge about the changing world simultaneously. In this regard, the internet is more competitive in offering real-time access to the events taking place both at home and abroad. With a smartphone or tablet, people can get the latest news on major social websites. In contrast, it takes time for newspapers to be composed and printed in factories before being sent to the readers, so the news reported might be that “fresh” to some extent. Another advantage of internet news is that it can be combined with audio and video clips, making it more vivid and informative. Though words and pictures in newspapers are good enough to convey basic information, they are a bit dull and rigid in forms. Besides, when reading newspapers, one can only see the attitude of the writer, but on the internet, there are places to post netizens’ comments towards the news, and the interaction makes online news more popular and inspiring. Nevertheless, those who stand for traditional materials claim that reading habit is hard to alter from paper to electronic screens, and as the most relied-upon source of information, newspapers boast a well-established set of censorship which blocks both careless writing errors and intended fake news. Therefore, they consider newspapers will remain the most significant news medium when the feeling of novelty towards internet has faded. To conclude, online news did lack strict monitoring in the preliminary stage, but as it upgraded, the superiority is hard to ignore: immediate, convenient, lively and interactive. With so many newspaper publishers choosing to issue E-versions of their papers, the internet is bound to take a larger share in the future newspaper business.